This is an extremely fast way to import large sets of resumes at once. 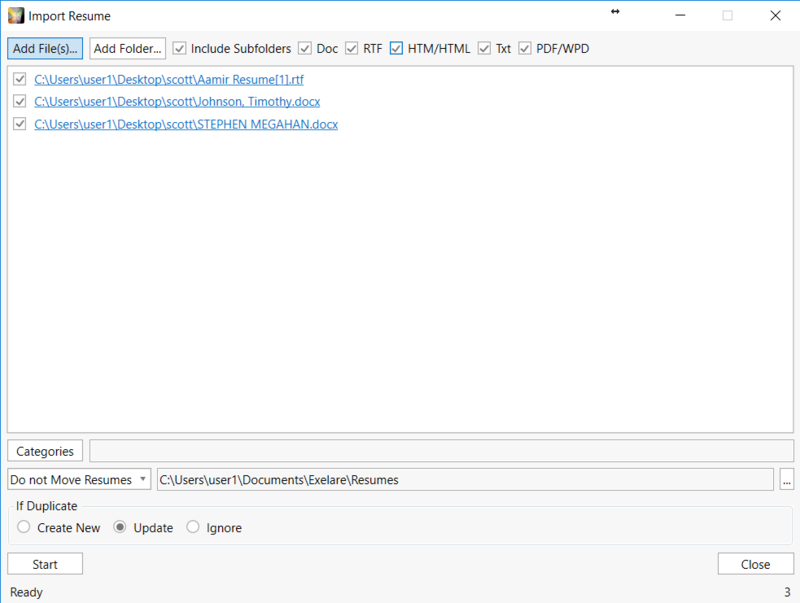 Very useful if you are just getting started with Exelare and want to pre-populate your database with existing resume files. Also very useful when sourcing online. Simply download any resume you see while searching for candidates online. Once you get the amount you want (10, 100, 1000, etc..), use the Exelare Bulk Resume Import and parse them all! In the navigation menu on the right hand side, click on Candidates>Dynamic Views>Active. 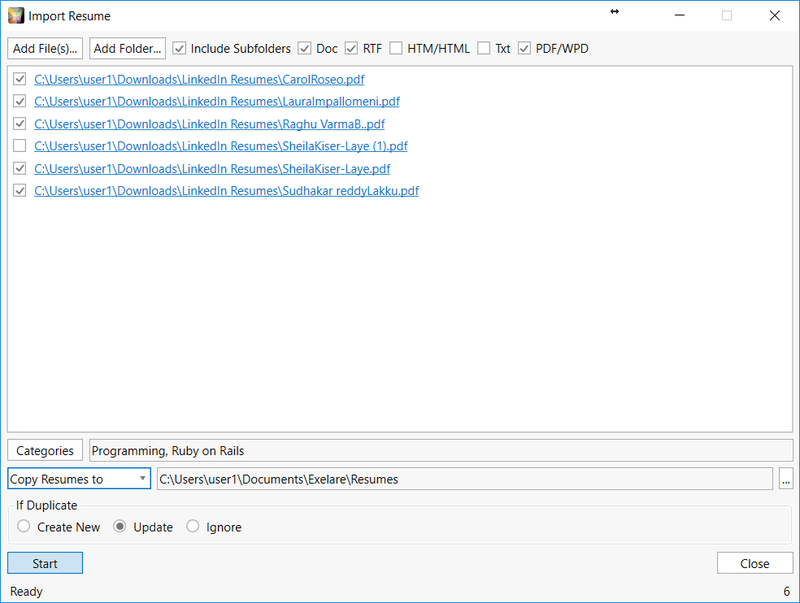 A new window will open allowing you to choose either Files, or Folders to include in the bulk resume import. 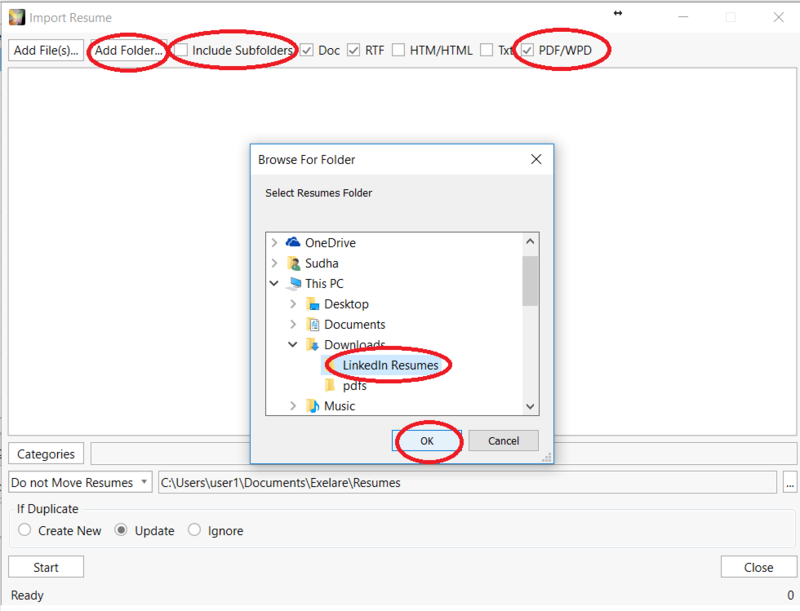 By clicking either option, your Windows File Explorer window will open, allowing you to locate and then any number of resumes to include in your import. 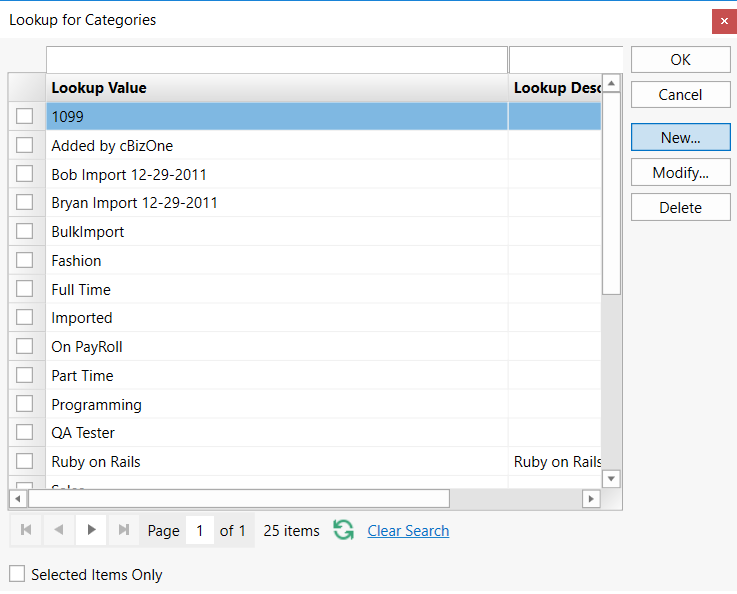 Categories - Click the Category button to choose an existing category type, or create a new one. By selecting a category, Exelare will automatically apply that same category to every candidate record created from this import. A good example might be: 'Import - 6/15/2016'. This way if you want to pull up the exact list of candidates you imported, you can quickly search by that category. 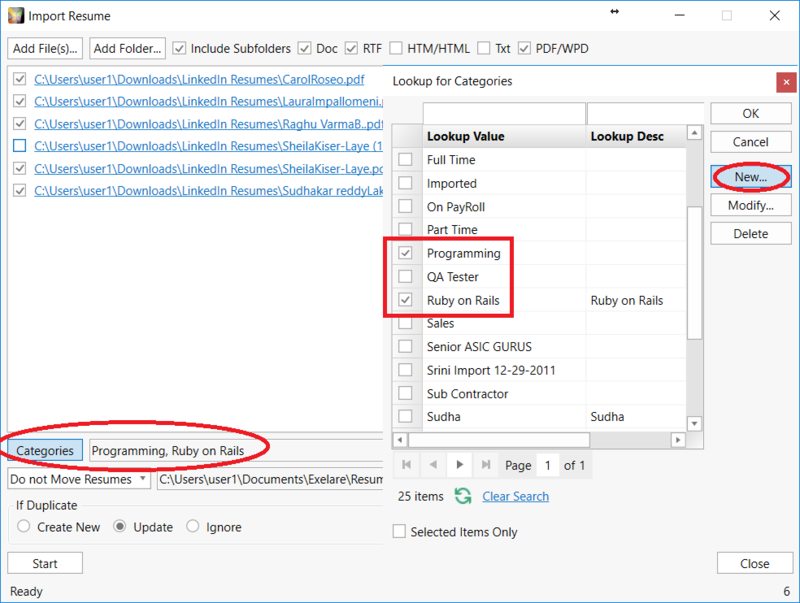 Another example would be adding a category that had meaning to you and how you want to search this candidate (ie: Programming, Ruby On Rails). You can choose multiple categories. Folder Clean Up - We recommend creating a folder somewhere on your computer named 'Already Parsed' Resumes. By doing so, you can use the 'Do not Move/Move/Copy Resumes' feature to keep your import folder clean. When this option is selected, along with a corresponding folder on your computer, Exelare will place any and all parsed resumes into this folder, thus cleaning up. leaving 'as is' or duplicating, depending on your preference. 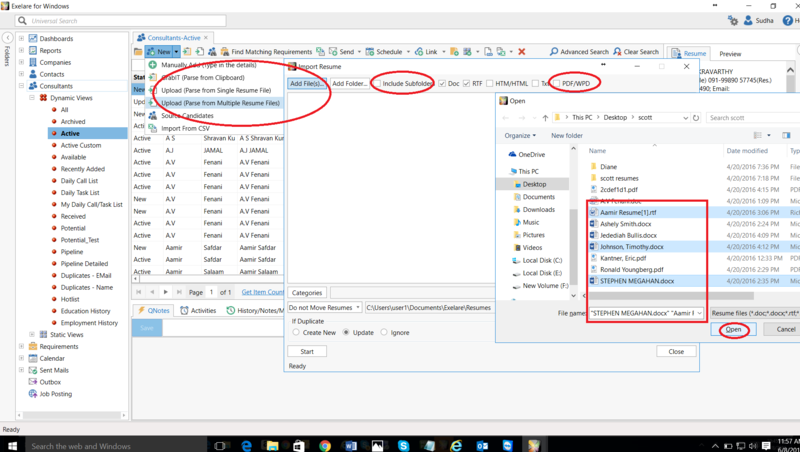 Duplicate Options - Tell Exelare what to do with a resume, if it detects it as a duplicate. Please refer to the tutorial link: How to Import a single resume from your computer?